National parks are an important part of the national estate. In 2010 Queensland had just over 250 national parks, covering 8,138,792 hectares and encompassing a broad range of landscapes and ecosystems. Each park is considered an ‘outstanding example of Queensland’s natural environment and cultural heritage’ according to the Department of Environment and Resource Management. Most people who visit a national park go to experience nature and admire beautiful scenery. This is one of their central functions but it is not the fundamental reason why national parks are declared. Rather, national parks aim to protect and conserve biodiversity and to guard against human interference. Sustainability is now the key principle that guides how national parks are used and who they are for. Queensland lagged behind much of Australia in the protection of its natural environment. In 1879 Australia’s first national park, National Park (now Royal National Park) was established 20 kilometres to the south-west of Sydney. 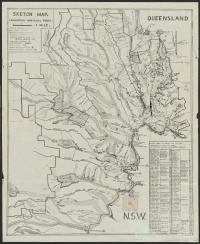 Conceived as a place of ‘public recreation’, National Park consisted of 7500 hectares of bushland. A number of the other colonies followed suit: South Australia with Belair in 1891 and Victoria with Wilson’s Promontory and Mount Buffalo in 1898. While there were certainly activists lobbying hard for land to be set aside as a national park, Queenslanders had to wait until March 1908 for the first park, 131 hectares at Witches Falls in Tamborine, to be declared. It now forms part of the Tamborine National Park. Although only a small area it did signal a growing recognition of the need to preserve native fauna and flora, in this case against the incursions of agriculture. 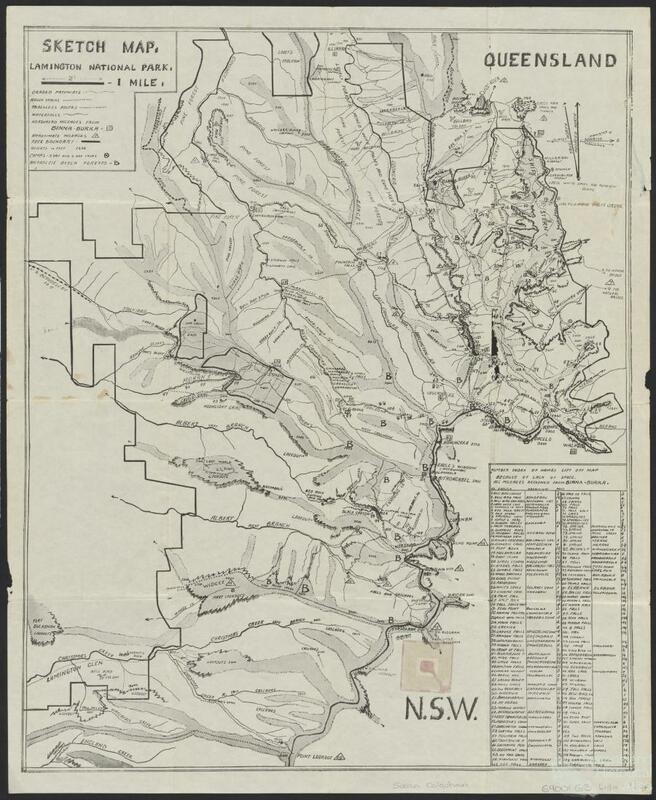 A more substantial park quickly followed with the declaration in July of 9000 hectares at Bunya Mountains. Here too lobbyists had fought hard to protect the area from economic development. Another park at Cunningham’s Gap was added in 1909 and by 1910 Queensland had seven national parks, the majority close to Brisbane. They became popular places of resort for harried urban dwellers. The most significant of Queensland’s early parks is Lamington National Park, located in the McPherson Ranges. Gazetted in 1915, the park encompassed 19,000 hectares of land, home to lush rainforests, waterfalls and varied birdlife. Interestingly its two main champions, Robert Collins and Romeo Lahey, both had backgrounds linked to the exploitation of rural resources. Collins was a pastoralist and Lahey the son of one of Queensland’s largest sawmillers. 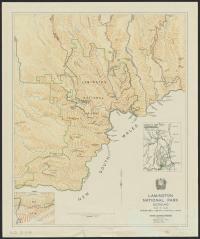 In 1930, Lahey and Arthur Groom established the National Parks Association of Queensland (NPAQ). As reported in the Brisbane Courier, 16 April 1930, the association aimed to ‘preserve intact in their natural condition the existing national parks of Queensland and to secure the reservation of other suitable areas before it is too late’. It consistently lobbied for more national parks and spoke out against proposals to build roads and luxury hotels in parks. 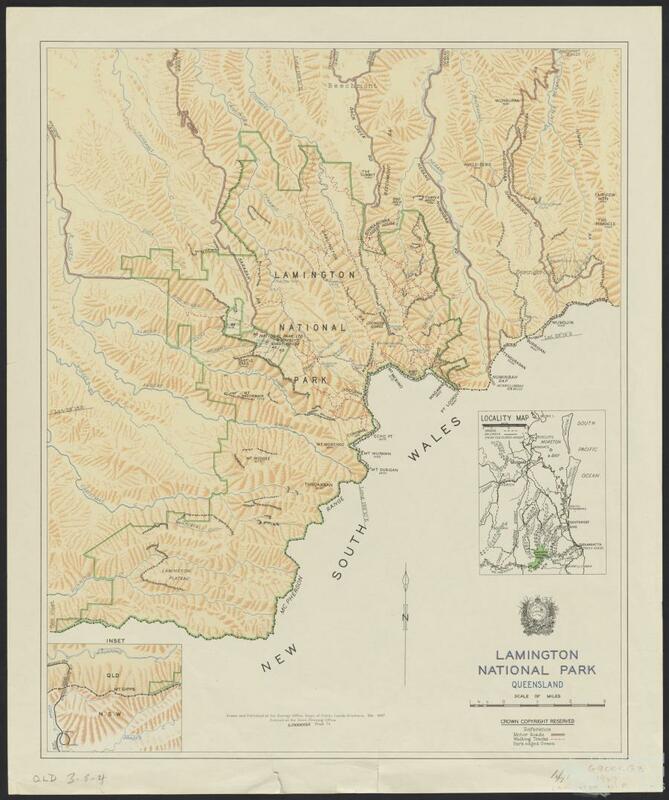 During the 1930s the Association had a number of successes and by 1940 Queensland had 183 national parks covering a total area of 217,208 hectares. This dramatic increase was in part due to the declaration of one hundred island parks off the coast, many of them very small in size and considered worthless for any other use. In Queensland, as elsewhere in Australia, national park status did not necessarily guarantee protection from development and resource extraction. Timber getting, for example, continued in the Bunya Mountains as did road building and grazing. Until the 1970s national parks were managed by the Department of Forestry and the ethos of conservation was sometimes overshadowed by the demands of powerful economic interests or simply by a lack of resources. Calls for the development of parks often came from tourist interests who wanted to make them more accessible. Such demands were largely resisted. As quoted by the historian Wendy Goldstein, in 1947 the director of forestry stated that ‘any “development” of parks must be based on the cardinal principle that they must be preserved as far as possible, in that simplicity and unspoiled beauty makes them unique, and not...cheapened to the level of hundreds of tourist resorts’. Many Queenslanders were enthusiastic in their embrace of the recreational possibilities of national parks. Picnics, walking, rock climbing, bird watching and camping were all popular activities. By 1955 annual visitation to Queensland’s national parks reached half a million people and just over a decade later the figure climbed to one million. At the same time that parks grew in popularity, the philosophy that underpinned them began to move towards protecting biodiversity against human interference rather than protecting nature’s beauty to serve the needs of people. When the management of parks came under the National Parks and Wildlife Service in 1975 it was the first time the parks were managed by a conservation agency. 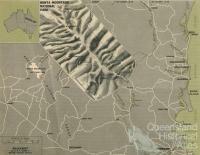 The decades that followed were important in the growth of Queensland’s national park system. 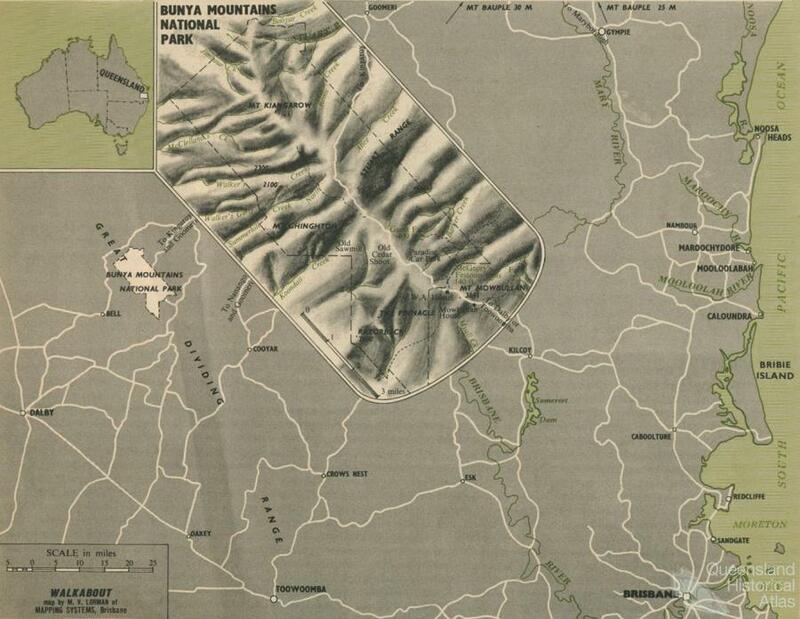 In 1968 just 0.54 per cent of Queensland’s total area was reserved as national park. By 1991 that figure had grown to 2.1 per cent. This was, however, still significantly lower than every other state in Australia. And yet the expansion was met with ‘fierce and often acrimonious opposition’, critics concerned that it represented a ‘land grab’. The 1992 Nature Conservation Act, implemented by the Labor government, was an important step in giving priority to the protection of biodiversity. According to the National Parks Association of Queensland, the ‘cardinal principle of management’ had now become ‘to provide, to the greatest possible extent, for the permanent preservation of the area’s natural condition and the protection of the area’s cultural resources and values’. Any use of such an area was to be ‘nature-based and ecologically sustainable’. In addition to ‘general’ national parks the act enabled the declaration of scientific national parks ‘to protect places or species with exceptional scientific value’. These parks cannot be used for recreation and entry is by permit only. The Act also recognised the significance of land within Indigenous culture in the creation of Aboriginal and Torres Strait Islander Parks. These are managed as national parks but where possible allow for the practice of traditional customs. This has sometimes resulted in conflict particularly when Indigenous cultural practices might go against western ideas of nature conservation. The government went a step further in 2007 with the establishment of a new class of national park on Cape York Peninsula. These parks, known as Cape York Peninsula Aboriginal land (CYPAL) ‘allow for existing and proposed national parks to become Aboriginal land’. Ownership is granted to the Traditional Owners on the understanding that the land is jointly managed with the government as a national park. Expanding the number of national parks and, in particular, ensuring that parks adequately represent the range of diversity of Queensland’s ecosystems, are ongoing projects. But while protecting biodiversity remains the cardinal principle it continues to rub against the competing demands of park users. National parks are a crucial part of the lucrative tourist industry, attracting more than 13 million visits per year. A consistent challenge for park management is how to balance the needs of animals, plants and habitats with those of people. Queensland’s national park system remains a work in progress.